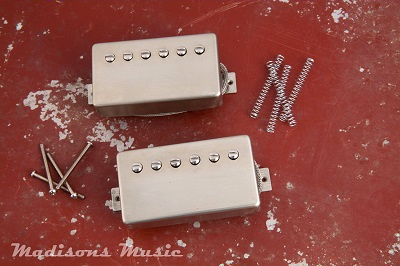 Crystal Clear Pickups Raw Nickel Late 50's Humbuckers. Hand wound with a vintage 42 gauge wire and mismatched coils. For these pickups we are using a raw unfinished nickel cover, great for relics and restorations! The pickups offer the tone and note expansion you would expect from a vintage PAF. The pickups have defined string definition and clarity! Coils are slightly underwound, Buytrate. 70's NOS Alnico 2 bar magnets.